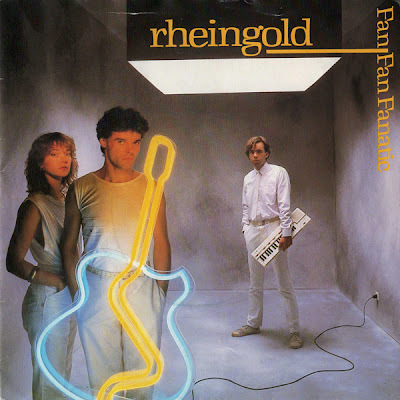 Rheingold was a German New Wave group that consisted of Bodo Staiger (vocal, guitar), Lothar Manteuffel (text) und Brigitte Kunze (keyboard). They sang both in German and English and released three LP’s and several singles between 1980 and 1984. Before they formed Rheingold, Bodo Steiger sang together in a band with Marius Müller-Westernhagen. Inspired through the Dusseldorf's music scene and fellow Germans Krafwerk, Steiger formed Rheingold who was named after the opera of Richard Wagner. Lothar Manteuffel wrote the songs and Brigitte Kunze did some vocals on their first self-titled LP that was released on Weltrekord. Their most successful single “Dreiklansdimensionen” was released in 1980 as well as the singles “Fluss” and “Fan Fan Fantastisch”. “Fan Fan Fantastisch” apperaed on their second album ‚R’ which was released in 1982. This song was also on a soundtrack to the film 'The Fan' which cast also included Bodo Staiger in the main rolles. Rheingold also released English versions of the songs in England and USA, not with much success as they hoped though. Neither did their last album show more success and so the band split and they never released music under this name. Lothar Manteuffel teamed up with former Kraftwerk musician Karl Bartos to form Electric Muzic and Bodo Staiger was working with ex Kraftwerk member Wolfgang Flur and today he’s busy as a music producer.